It’s one thing—no small thing—to invent a piece of equipment that makes farming easier or more profitable. It’s quite another to protect, develop, market, and profit over the long term from one’s innovations. Celebrated Saskatchewan examples of the latter include the late Kenneth Summach and his Flexi-Coil juggernaut, and Norbert Beaujot’s revolutionary Seedmaster and DOT Technology. When Saskatoon’s Trevor Thiessen and Dean Mayerle bought Redekop Manufacturing from the Leo Redekop family in 2014, they were determined to protect the company’s intellectual property and secure solid patents for future innovations. Thiessen says that while Leo Redekop experienced a few patent-related issues during his days at the helm, the former owner understood the value of intellectual property and secured about a dozen patents for his company, maker of the industry leading Maximum Air Velocity (MAV) Straw Chopper. It’s hard to imagine two men better equipped than Thiessen and Mayerle to protect Redekop’s innovations, create new ones, and make and market them worldwide. Thiessen, president of the business, has enjoyed a highly successful career in the agricultural biotech industry. After earning commerce and master of business administration degrees from the University of Saskatchewan he landed his first “real” career job at Saskatoon’s microbial technology firm Philom Bios, under the tutelage of company co-founder and provincial biotech pioneer John Cross. After Novozymes A/S acquired Philom Bios in 2007, Thiessen was appointed president of Novozymes’ BioAg Group in 2009, a position he held until 2014. Mayerle, meanwhile, is a mechanical engineer who worked as a design engineer at Flexi-Coil and then leader of a design engineering team at CNH Industrial, which acquired Flexi-Coil in 1999. Mayerle is Redekop’s general manager in charge of research and development, and all other things technical. Sales in Europe have gone from nil to about 20 per cent under the new ownership and Thiessen is excited about the prospects for more growth in Europe as well as in the U.S., where the company now earns about 20 per cent of its sales revenues; Australia accounts for approximately 10 per cent. 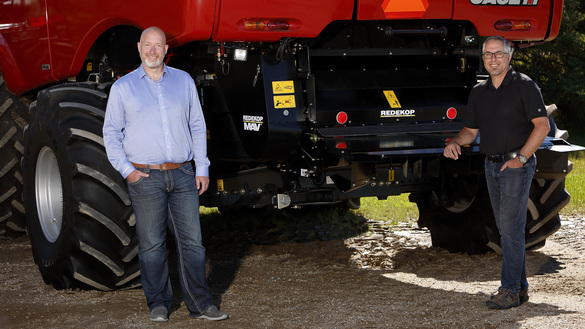 Thiessen is keeping his cards close to his chest but does allow that Redekop, which employs 25 people, has a number of new products in the hopper. Sales of the MAV Straw Chopper remain Redekop’s primary business. Incorporated into new combines through arrangements with manufacturers or retrofitted onto older ones, the Redekop choppers excel at reducing the size of straw stocks and increasing their number of infection points, enabling soil microbes to break down the material faster. Redekop choppers distribute straw and chaff evenly across the width of the cut and can be fitted to generate residue that’s maximized for use by specific crops or in different growing seasons. “In Saskatchewan, we have this issue where after we harvest it gets super cold and very little happens in the soil until spring,” says Thiessen. “In an environment like the U.K., where we now do quite a bit of work, they can see the breakdown of that straw happening in the first two or three weeks after harvest. So they want to get as fine a chop as possible.” Redekop also sells parts to repair and maintain older straw chopper equipment. Thiessen says Saskatchewan is a superb place to develop an agricultural equipment business. The large, local market is a great place to test new products and build a business “and you can have lots of success before having to think about international growth.” The local agricultural equipment industry is supportive, he says, and there’s nothing like hiring Saskatchewan farm kids to work in the shop. “Their work ethic, understanding, and passion for the agricultural industry are second to none.” He also offers kudos to Saskatchewan Trade and Export Partnership (STEP) for its integral role in helping Redekop gain knowledge and confidence needed for international growth. Support is important, but motivation remains a critical requirement for business success in Saskatchewan. In that regard, Thiessen says the words of John Cross gain more meaning with each passing year. Not long after joining Philom Bio, Cross came up to him and told him he’s very fortunate to be working in agriculture.